Zlatan Ibrahimovic has been in the news quite a lot lately, be it for his public support of struggling Manchester United boss Jose Mourinho, or due to the surprising reports of the Red Devils wanting to re-sign him come January. Apart from this United-related news, however, the Swede has also been lighting the MLS up through his stellar performances for LA Galaxy. 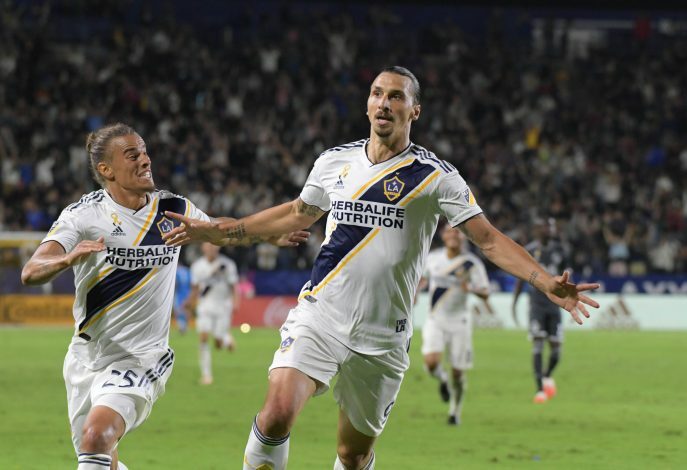 The 37-year-old has already scored 21 goals and bagged 9 assists in the 25 games he has played for the Los Angeles outfit so far, and it doesn’t look like the in-form forward intends to stop anytime soon. In fact, Zlatan’s swagger on the pitch was once again on display when his side took on Sporting Kansas City this past weekend. The former Barcelona and Manchester United man not only scored in the 1-1 draw, but also showcased a sublime piece of skill, which was followed up by possibly the most Zlatan-esque reaction. During one moment of the game, the fearsome striker came face-to-face with Sporting KC midfielder Felipe Gutierrez. The Chilean tried to tackle Zlatan, but the experienced forward simply performed a feint and cut inside, thereby easily fooling Gutierrez, who ended up sliding past the 6’5 veteran.